Its mild climate and relaxed lifestyle make the state of Texas a very attractive place to retire. The fabulous amenities, personalized service and fraternal environments of our communities on the list make them irresistible! To read more, visit https://www.55places.com/blog/10-best-selling-communities-in-texas. 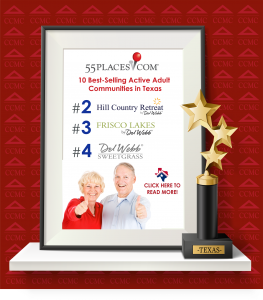 Congratulations to Hill Country Retreat, Frisco Lakes and Del Webb Sweetgrass!